The leadership of this member-owned organization continues to solicit suggestions for additional improvements. Check out the Statistics page to see who's done what! Also check out the Schedule page to find information on future tournaments and the results of ones that have already been bowled. Download 2018 - 2019 schedule here. 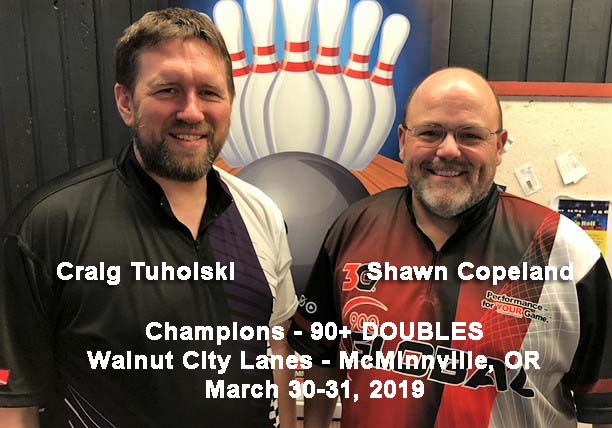 Two of the Northwest's biggest names in bowling, Shawn Copeland and Craig Tuholski, teamed up to win the 2019 NW Senior Tour 90+ Swiss Doubles at Walnut City Lanes in McMinnville, OR. Copeland and Tuholski began the second day in 8th place. Their 521 in game 7 of the tournament started the march to the top. Averaging 228 as a team for the tournament the duo won five of six matches on Sunday. After 11 games the tournament leaders were Frank Dietz Jr and Dan Lancaster by a mere 20 pins. Copeland and Tuholski were too strong and won the deciding match 501-415. Finishing third, six pins out of second, was the strong team of Mike Polinsky and John West. Don Woolard and Garret Ball had a good tournament capturing the fourth spot. Another spot back in fifth were the tournament hosts Jerry and Ken Rettke. Many, many thanks go out to the Rettke family for showing great hospitality to all of the bowlers and their guests the entire weekend. Also, a special thank you to Kevin Olson of H & R Block McMinnville-Willamina for sponsoring the tournament along with Walnut City Lanes. Hammer Bowling is a season long sponsor of the Northwest Senior Tour.